Good morning all. Hmmm, I am surprisingly bouncy today ... odd, especially as it is a Monday (right?). I don't know, things just seem right in the world, for a change. It's not the weather because it is heavily overcast here - not that I mind at all, really ... I'm from Cape Town and this sort of weather conjures up days of rain and duvet's, hot chocolate and fire-side reading. Lovely :) It's not work, per say, since I have already had to deal with the idiot-people on that annoying project ... let's call it Collapso (like we do here anyway ;) ). I think it's the calm that comes from having made the Job Decision, a good weekend filled with all sorts of activity and pretty much having figured out what's potting between Varen & I. A good evening where she got to point out a number of her ex-toys :) I guess Jhb is just as small as Cape Town when you've lived here your whole life. Then there was Saturday. I went out shopping for Book Club books while Loulou prepared for her kiddies-style bday party. Got some fabulous books after pacing between Estoril & Exclusives at Cresta for hours. Turns out Estoril Books (how does a book shop not have a website?!?) is now my favourite real-life book spot. If you buy 3 books or more, you get 20% discount on each book! That is amazing ... and way better that Exclusive's piddly little "if you spend over R300 your get 10% off the total price" book club discount! And the last Monday of every month they have 20% off all the books. Yay! Anyway, then it was back home to Loulou's Bday Party. With paper hats and sweets from the old days (chappies & fizzers) and bacardi jelly :) Was a fabulous afternoon with much drinking and a sugar-high. Afterwards we ended up gate-crashing someone else's birthday party ... some friend of one of the boyfs at Loulou's bday. Fun was had by all. And after starting at 3 in the afternoon we finally fell into bed at 00:30-ish. It was a long day. As was quite clear the next morning when Loulou & I failed to get out of our pajama's till at least midday, actually I'm not sure if she did at all :) I breakfasted on left over chips and dip ... healthy! At around half past one Varen popped by to pick me up for lunch. This is turning into a fairly interesting break-up. But I think I can categorically say we appear to not be broken up. That's not to say we're back together, exactly. We're sort of seeing each other. Which is not to say we can't go out and do our own thing and meet new people ... but we're still exclusively involved with each other for the mean time. weird but somehow more stable than it was before ... I think it's a lot to do with taking the pressure off. So we went to lunch at Luca's since after all the crap I'd eaten yesterday I felt a serious need to detox with their fabulous salad - yes mom, I actually went out to eat with the sole purpose of ordering a salad! Which was fabulous, the company and the salad :) After that we ended up at his place finishing Season 2 of House. And then we had a most annoying Mr Delivery incident. We ordered Scooter's pizza for dinner ... back to that super-healthy eating, I know! We ordered at 6:30pm. At 7:30 he phoned to find out exactly how much longer our order would take. Another hour apparently, they hadn't even placed the order yet as they had a back-up and were short one driver. How is this okay? Does no one in South Africa complain? Why do we just sit back and accept such shoddy service every day? When he got off the phone I said no ways. Scooters has a "delivery within 40 minutes or your food free" policy. That will still be quicker than the idiots at Mr Delivery. So we cancelled the Mr Delivery order ... they didn't even bat an eyelash or put up a fight. Called Scooters and discovered that not only would it arrive sooner, it was cheaper and we'd get a free pizza. Hello? 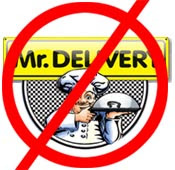 Why, exactly, does anyone use the crappy Mr Delivery? Our food arrived, we ate and watched more House. At 9pm, a Mr Delivery driver showed up with our cancelled order. Stupid, stupid, stupid. And annoying. Oh, and in other news, we're busy organising our 10year high-school reunion. I cannot believe it is ten years already. What do I have to show for it? Anyway, it's been great getting back in touch with loads of the old people and I think it'll be quite fun to see them all again. Although it appears that half our year is over in the UK, so we'll have to have 2 separate reunions. I may have to pop over for the UK one ... since that's where all the single folks seem to be. I'm pretty sure the Cape Town one will turn out to be a mommies & babies day out with no one drinking and everyone wrapping up their bundle to get home by 5pm for nap time and a feed. Yawn! Go The Lions! Your breakup sounds interesting - wish mine was as fun as yours. My break-up isn't that interesting, it just seems to have turned into a non-event. Which I guess is a fabulous thing :) I just hope we're not delaying the inevitable ... either way it's still great fun right now! And I thought you were in the middle of dating season with about 5 girls falling over you (yes, I have your blog on rss) ... or are you referring to a previous break-up?